Global Travel Media » Blog Archive » Finns Fresh Sushi – Sake It To Me! Finns Fresh Sushi – Sake It To Me! So you fancy a bit of sushi eh? 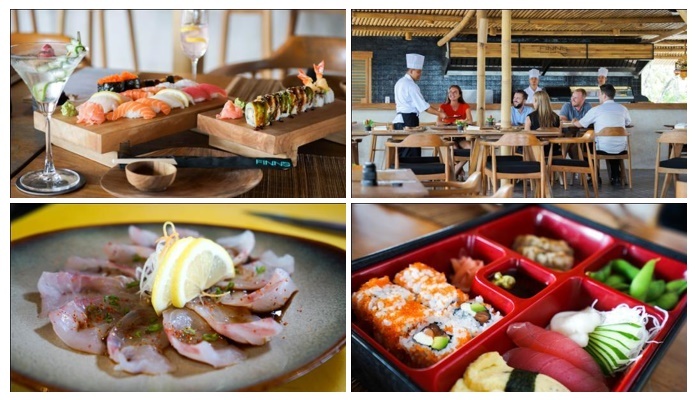 Well splash out the sake because Finns Beach Club has just opened their new Sushi Bar and the food is fab! Now you might wonder why a popular Bali beach club would incorporate a sushi bar into their already successful mix? Well, what could be better than to tuck into a dish of the freshest fish while having the benefit of a beachfront view and a sake or two! Maybe the idea of eating raw fish did not appeal to as many several years ago, but with the raw food movement in full swing and the masses making a change toward clean and healthy eating, sushi is indeed in vogue and Finns Beach Club have just the crew to make the most of the island’s freshest seafood and transform it into a mix of amazing flavours. With experience in Japanese cuisine for over 15 years, the team of chefs come well versed in the delicate art of sushi. Training under the expert guide of a Japanese chef for a number of years then spending considerable time honing their culinary skills in 5 star hotels in the Cayman Islands and Ritz Carlton, Nusa Dua, these guys are no strangers to sashimi, sushi or tempura and it shows! Finns Sushi Bar’s dedicated menu is comprehensive without being overwhelming. Unlike many sushi restaurants, it does not offer pages and pages of options to pour over, but a succinct selection of flavoursome and fresh food done well. Starters include light and fresh favourites for sharing such as edamame, gyoza and yakitori, as well as the must try menu item for fresh fish lovers – the Uzusukuri. Carpaccio style white fish is sliced impossibly thin, with flavours of the star ingredient accentuated by a delicately infused, truffle ponzu sauce. Ask the waitstaff about the possibility of adding some fresh wasabi (the real stuff mind you, not the grass green, horseradish paste we are all familiar with) and you are in for a visual feast as well as a chance to treat your tastebuds and spare the sinuses! The wasabi (a root imported from Japan) is actually grated at your table using a traditional shark skin board. A bamboo brush carefully collects the residue of fresh paste and, after waiting five minutes for the complete kick of the wasabi to develop, just add it to your fish and experience the flavour sensation. Fresh wasabi still packs a punch. It’s strong and hot but without the lasting burn of horseradish and thankfully, minus an assault on your sinuses! But you need to indulge quickly, as the full, somewhat herbaceous flavours of this fresh condiment disappear after twenty minutes! The Signature Rolls at Finns Sushi Bar are almost too pretty to eat. Whether you’re a slave to social media or not, you’ll want to snap a pic of this before you sample it, however, one taste of their Dragon Roll and you’ll soon forgo any artistic appreciation for the sake of a screaming tummy! Portions are generous and prices reasonable but freshness and flavour are the real winners of each dish. It gets even better! The food menu is complemented by a beverage list that includes a Sake selection comprehensive enough to make any serious souse stand up and say “Kanpai!” Having a distinctive style, sake may not be to everyone’s taste but I’ll bet my bento box you’ll really love Finns sake inspired cocktails! If you like your martinis, why not try their Saketini – a mix of chilled vodka, sake and cucumber. Cool as! All sakes are available by the bottle, with a decent selection also available by the glass. Open for lunch and dinner, drop in and get your Finns sushi fix day or night. If you’d prefer to soak up some sun at the same time, simply grab a day bed and kick back with one of their Bento Boxes. Filled with a variety of tasters, these are a great way to sample some of the Sushi Bar menu from your beach towel. Take away options are also available. Even if your skills with a set of chopsticks is a little suspect, be sure to stop by soon and try Finns sushi, where fresh seafood is certainly the order of the day!